of its kind that I have ever been to. Perfect." business partnerships and strengthen your existing ones. Live Events re only really beneficial for big companies right? No. This is a common misconception and can lead to many small businesses shying away entirely from a potentially huge marketing opportunity. The key is making sure you target the right event platform. Live events work because we are social creatures and we love interacting with other people. Meeting your clients face-to-face and making a positive impression is the surest way of guaranteeing a long-term customer relationship. This simple principle can benefit all businesses irrespective of size. 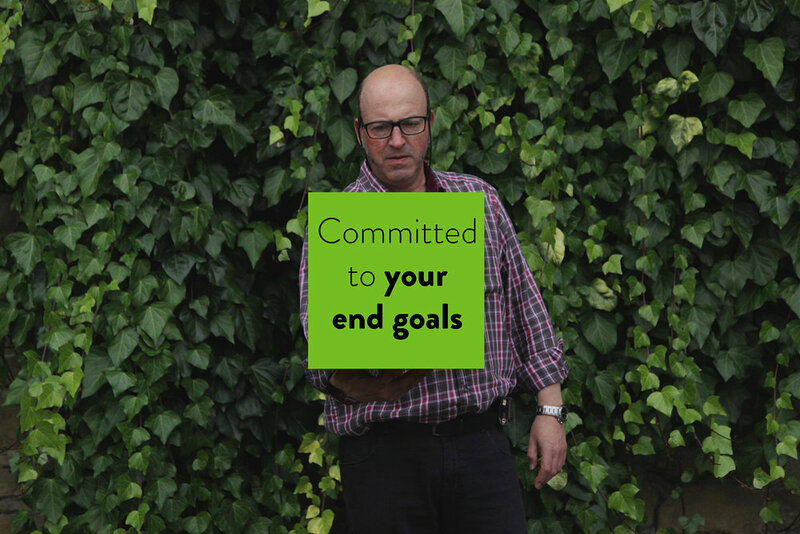 How can you help me maximise return on investment? Making the most of a live event is critical and we understand that customer interaction shouldn't be limited to those attending, or stop once the event is over. Fortunately we've got the skill set to help you maximise you event, either through engaging secondary audiences in real-time on social media platforms, voting keypads for vital merketing feedback during an event or creating custom websites and videos to support the event and give attendees a resource platform to keep them engaged, months after the actual event has taken place. to focus on what you do best. "On behalf of the Global Team let me thank you for your efforts in creating a great meeting which was flawlessly executed. From our opening session and video, the bridges, the content, good science, liaison and transport arrangements and the AV and closing video we were delighted with it. I know that there were more people present but please pass our thanks to those other team members who contributed to this success." ...leaving you to pick up the applause at the end. your live event can evolve. along with on-site video and post-production. "Now that we are back in the office, I would like to thank you all once more for your contributions that made this such a successful meeting! Logistics were executed with military precision and feedback from everyone I spoke to was uniformly high. Absolutely outstanding." What do you mean by Live Events? 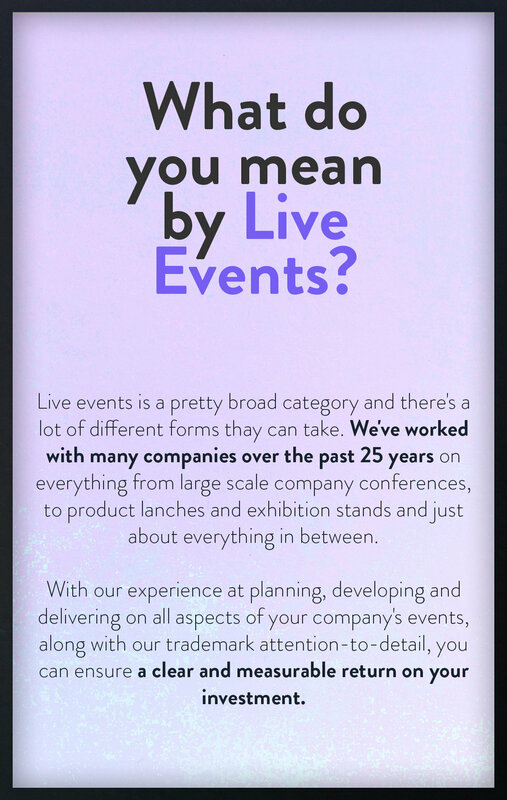 Live events is a pretty broad category and there's a lot of different forms thay can take.We've worked with many companies over the past 25 years on everything from large scale company conferences, to product lanches and exhibition stands and just about everything in between. With our experience at planning, developing and delivering on all aspects of your company's events, along with our trademark attention-to-detail, you can ensure a clear and measurable return on your investment. What is the benefit of a Live Event? For many companies, video marketing is just one tool available and live events serve as another key element for engaging potential customers. Business exhibitions are a proven option and thanks to our experience, we can help you secure the right size and space to properly promote your brand, at the right price. We'll also work with you to develop a stand that matches your company goals and delivers your message effectively. If you're looking to take the next step and host your own live event or conference, we can offer you advice on what form the event should take and can provide all aspects from lighting and staging down to video content and on-site direction and production.